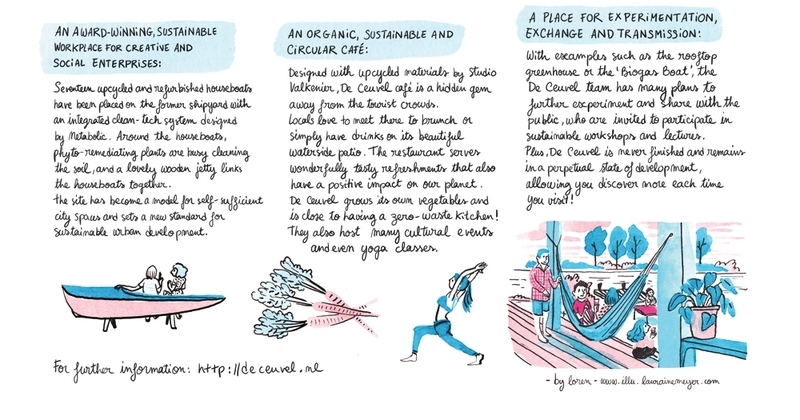 De Ceuvel is an urban playground for sustainability, innovation, and creativity. The former shipyard turned award-winning, circular office park for creative and social enterprises is adjacent to the Johan van Hasseltkanaal off the river IJ in Amsterdam North. In 2012, the land was secured for a 10-year lease from the Municipality of Amsterdam after a group of architects and Metabolic won a tender to turn the site into a regenerative urban oasis. The workspaces are second-hand houseboats which have been placed on land and outfitted with clean technologies. They are connected by a winding jetty to protect the grasses and willows which work to phytoremediate (read: clean) the polluted soil over time. It has been dubbed an official "cleantech playground" as we experiment with alternative sanitation, agricultural and energy systems. Before entering my current consultancy role at Metabolic, I managed Metabolic Lab, the cleantech showcase facility at De Ceuvel. I also built their new website and still regularly give educational tours (and lectures) around - and about - the site. Illustrations by the talented Lauraine Meyer. For more of my website design, please see CarbonX, Blueforest Environmental Development and Era2 Ventures. Are you interested in building a new website for your latest endeavour? Please contact me and I will get back to you as soon as possible. Thank you.